Barn World is proud to offer the Big Wheel hog feeders from Osborne. Keeping your feed fresh for your pigs is essential in getting them ready for market. 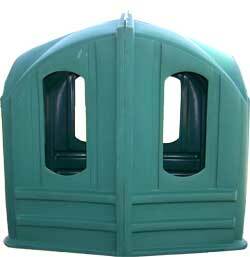 The big wheel pig feeders are designed to eliminate waste from spoiled or spilled feed. They are much more efficient than the best gravity feeders as the feed is only dispensed when the paddle wheel is turned by the pigs. It does not sit in the truck waiting to be consumed. 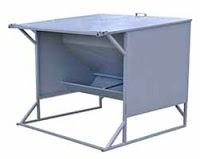 This ensures the fresh feed in the hopper is delivered to the trough clean and ready to eat. Eliminating the square corners of a rectangular feeder keeps the feed from accumulating in corners, turning stale, rotting and going to waste. 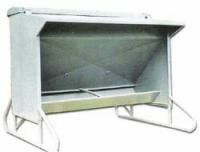 The round trough and sweeping action of the feeder arm keeps the food supply fresh and will be consumed in its entirety by your animals. All the pig feeders come with an adjustable rate gauge to control the amount of food dispensed when the wheel is turned. Inside the feeder, the flow system is controlled by an adjustable cone they can be raised and lowered in the bottom of the hopper. It is the cone that regulates the rate of feed flow, not gravity. As the pigs eat, they move the large feed wheel sweeper arm in the bottom of the trough. They don’t know it, but the sweeping action literally cleans the bottom of the trough and dispenses fresh feed at the preset rate. As the feed wheel is agitated feed falls through the center hole of the cone and into the trough where it is dispensed to the pigs. When they stop eating, the lack of movement on the sweeper arm stops the flow of feed. As such, these big wheel feeders are self-cleaning and self-regulating which reduces feed waste to none! The Osborne feeders are designed and built to last for generations. In fact the very first big wheel feeders were built 20 years ago and are still in use today. The frame is made with heavy-duty steel construction and the fiberglass troughs and hoppers are easy to clean, maintain and can be used indoors or out. The feeders can be anchored to almost any service and maybe placed in a fence-line to handle every type of feeding situation. Their large trough openings and round shape give pigs much better access and provide more trough openings than rectangular feeders can. Easier access and adjustable flow rates create a less stressful eating environment and will allow your pigs to eat in less time with less stress. Fresh feed is critical for young pigs as they are very sensitive to stale feeds. The patented mechanical flow delivery system of the Osborne nursery feeder guarantees fresh feed every time. The agitation on the sweeper arm keeps the trough clean and dispenses feed only on demand. All types of feed including crumbles and pellets can flow through the system without damaging it’s texture or appearance. These conditions allow the pigs to eat at will while maintaining the fresh, unneeded green in the hopper. This produces a better quality of gain for consumption and will better the overall health of your pigs. The careful design of the head space openings and trough reduces eating stress and promote consumption, producing better gains. Available in the one bushel, 3 bushel and 4.5 bushel sizes, these nursery feeders are the best in the industry. As your pigs grow in size, the main sources of food waste are more pronounced but are still eliminated with the patented delivery system of the big wheel feeders. The self dispensing feeders required no human activity and eliminate waste on their own by stopping the feed from entering the trough when the pigs are not eating. The self-regulated and self-cleaning finishing feeders will completely eliminate spoilage. Available in three sizes from 4.5, 7.5 and the 15 bushel capacity these finishing feeders will reduce your management time and minimize feed waste to guarantee maximum efficiency. Just like the smaller models the big wheel feeders, the bulk hog feeder is designed for maximum efficiency and the elimination of spoilage. The feeders are engineered to last for decades while minimizing your time, waste and need for adjustment. The reinforced fiberglass and hot-dipped galvanized steel supports all add up to a feeder that will produce healthy weight gains in your pigs for generations to come. Hopper lids are not needed as plugging is never a problem even in heavy rains. The self-cleaning movement of the patented sweeper arms keep the feed flowing regardless of conditions. Set your feed rate once with the easily accessible outside mounted controller arm and it will remain constant for years to come. Designed to be used with 90 head and possibly more, the big wheel bulk feeders are available in five different capacities: 24, 45, 65, 85 and 105 bushels. Using the same self-cleaning and regulating feed delivery system inside the hopper, the capacities are adjusted by adding rings to the height of the feeder. Available with an optional galvanize steel skid to be mounted underneath for easy moving, these pig feeders are some of the most versatile on the market today. Be sure to contact Barn World for all your cattle guard and livestock supply needs today. Hay Hopper Hay Feeder from Barn World – a hay feedeer designed to minimize waste and maximize profits! Here’s a great video demonstrating the cost savings of our hay hopper hay feeder at Barn World. 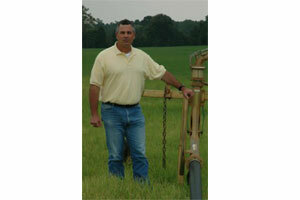 This great design minimizes hay feeder waste and maximizes your profits. The hay feeder ships as 2 pieces and ships competitively throughout the United States. Call us today for shipping quote and start saving money immediately and take a look at all of our hay feeders that we have to offer. Don’t forget Barn World is more than just livestock supplies, we also carry everything from cattle guards to saddle pads to feed bins. 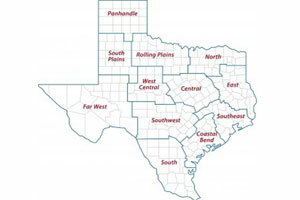 Visit Barn World.com today or call 720.238.2190 for all your farm and ranch supplies. If you’re looking for a heavy-duty hay feeder that will pay for itself, then you’ve come to the right place. 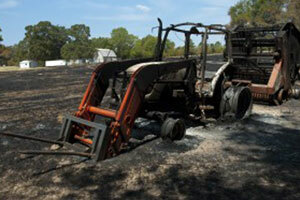 Our hay hopper feeder will help eliminate waste. If you’re currently using a standard a feeder, you could be losing 10% of your hay. If your hay is $100 per ton, and you feed 2000 pounds per day, you’re losing $10 per day, $300 per month or $3600 per year. Though continue to throw away your hard-earned money, purchase a hay hopper feeder from the Barn World Farm & Ranch Superstore, you can put more of your money in your pocket at the end of the year. 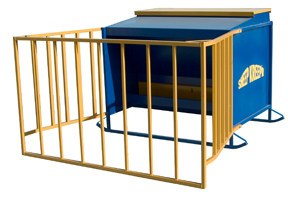 Our hay hopper feeder comes with or without steel around the bottom. Just let us know what you want by giving us a call at 720-238-2190 and start saving your money. Our two-piece design makes shipping affordable anywhere in the US. 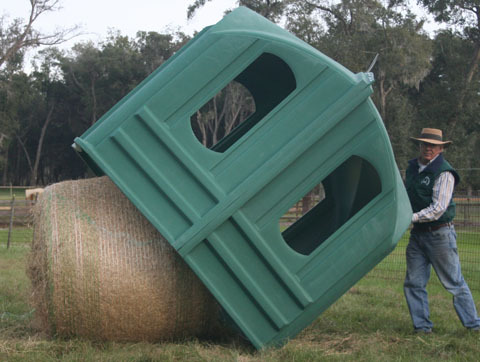 Hay Feeders: Bull Tuff hay feeder from Barn World – one tough hay feeder! Barb World has a large selection of hay feeders. One of the toughest hay feeders on the market is the Bull Tuff hay feeder.